On Thursday 25 October 2018 Gloucester Rugby former players and one of the current playing squad presented examples of the 2018 poppy shirt to representatives of the Allied Rapid Reaction Corps stationed at Imjin Barracks, Innsworth. 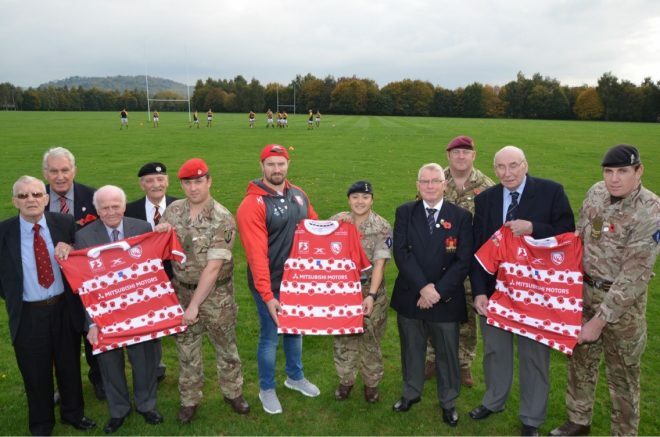 The poppy shirt will be worn by Gloucester Rugby in their home matches leading up to Armistice Sunday on 11 November 2018. Wearing the specially commissioned shirts is just one of the activities the Club is undertaking as part of the national “#ThankYou100” campaign to mark the 100 years since the armistice at the end of the Great War. The Club is also running a social media campaign recounting stories of some of their previous players’ exploits during the Great War. 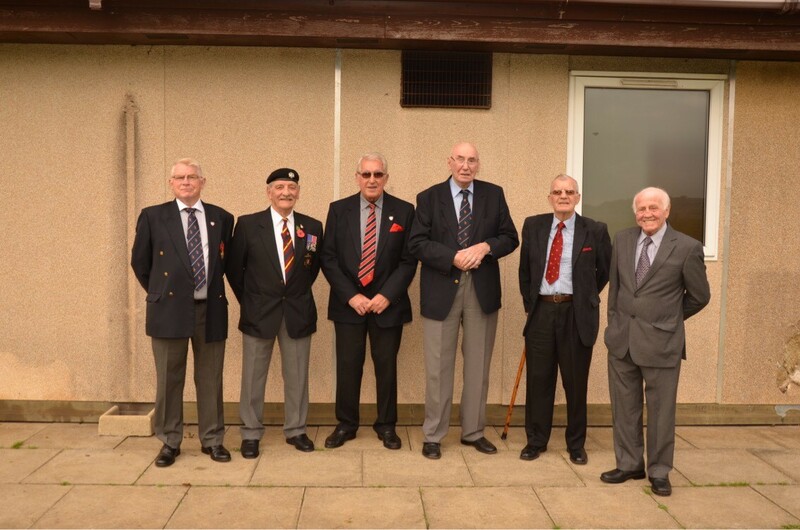 The top picture shows the handover of the shirts by, from left to right: Mickey Booth, Harold Symonds, Brian Reade, Dave Fell, Paddy McAllister (a member of Gloucester Rugby’s first team squad), Ron Etheridge and Peter Ford. Ron Etheridge who is Secretary Gloucester Rugby Players Association. Dave Fell joined up at the age of 17½ as a regular in 1955. He did his basic training at Hadrian’s Camp, Carlisle, after 6 weeks he was posted to Kings Dragoon Guards and sent to Malaya on active service. David served there for nearly 3yrs attached to the Gurkha Regiment and became involved in the Malaya Emergency, finally returning to the UK in 1958. Harold Symonds was called up and completed his National Service. Peter Ford was called up and completed his National Service. Mickey Booth was called up and completed his National Service. Brian Reade served in the Army during the 1950’s initially in the Gloucestershire Regiment. He was transferred to the Hampshire Regiment, where he served in Germany and Malaya.